As the days get colder and the nights draw in there’s nothing better than a little indulgence to warm the soul. 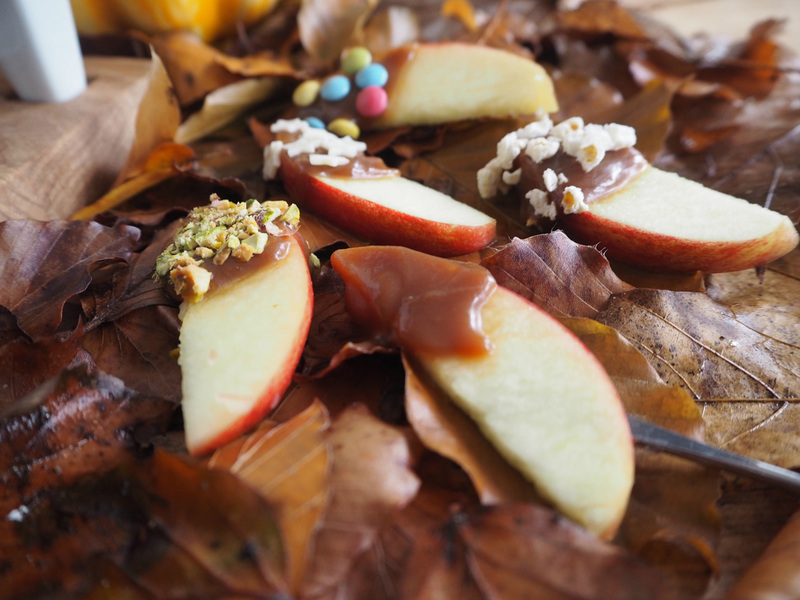 One of the classic Autumn treats, toffee apples bring back the nostalgia of huddling around a bonfire and watching fireworks light up the sky. 1. Over a low heat, dissolve the caster sugar with 3tbsps water. 2. Bring this to the boil, without stirring. Once the sugar has turned into a dark caramel colour add the butter and whisk together. 3. Remove the pan from the heat and stir in the double cream. 4. Keep this to one side for now. If you have a fondue set, that’s a perfect way to keep the caramel warm, if not, place in an oven proof bowl and keep this warm in the oven on the lowest setting. 5. Next, cut the apples into slices – these need to be big enough for dipping, but not too thick. 6. Add the popcorn to a bowl and crush it into tiny pieces. Do the same with the pistachios in a separate bowl. 7. Put all the toppings into separate bowls. You can use any toppings you like here as long as they’re small enough to dip into. 8. Take your caramel out of the oven and place on a table with the other bowls of toppings, apple slices and the skewers/toothpicks for dipping. 9. Finally, have fun using the skewers to pick up slices of apple, dip into the caramel and try all the different combinations of toppings. Our Leisure gas range cookers are expertly designed to give you the best results every time.